How much improvement do we get from Cleaning Solar Panels, in Modesto, CA? You see a nice difference between these two days, but perhaps it might be unfair it might have been a cloudy day before cleaning. Dirty vs. Clean Solar Panels. 4 days before and 4 days after washing. There is a 26.7% difference in my case here with washing!! But I think there’s a better way to measure, taking the two best days of the 4 days before and the two best days of the 4 days afterwards, the difference comes out to 13.3% difference. 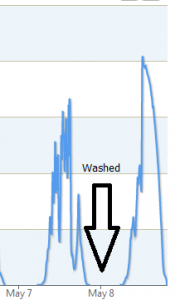 I think two days before washing the solar panels, the skies were a bit cloudy. My conclusion so far is that washing the solar panels will increase output by 10% or more. 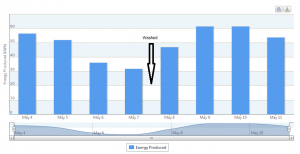 How much electricity does my solar panels produce in one day? Let’s take one day in the solar energy/electricity graph above. Thursday, May 9th. They produced 61.3 kWh’s of electricity. 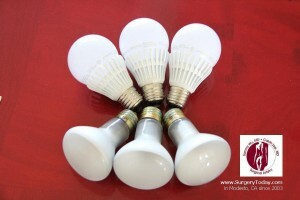 Let’s see 61.3 kWh’s = 61,300 watts hours so in terms of 100 watt light bulbs, you could run 613 of them for 1 hour. How does that sound?? Or I did another calculation… You could drive a TESLA electric sports car at 55 miles per hour for about 240 miles with that kind of electricity. Or if I did the calculation properly, you could run a 1200 watt hair dryer for 51 hours. Disclaimer: My calculations are approximate, not exact. Plus I don’t do calculations like this professionally. I think it’s worthwhile to have the extra 10%+ of electricity especially on the higher producing electricity days. This very important to plastic surgery! 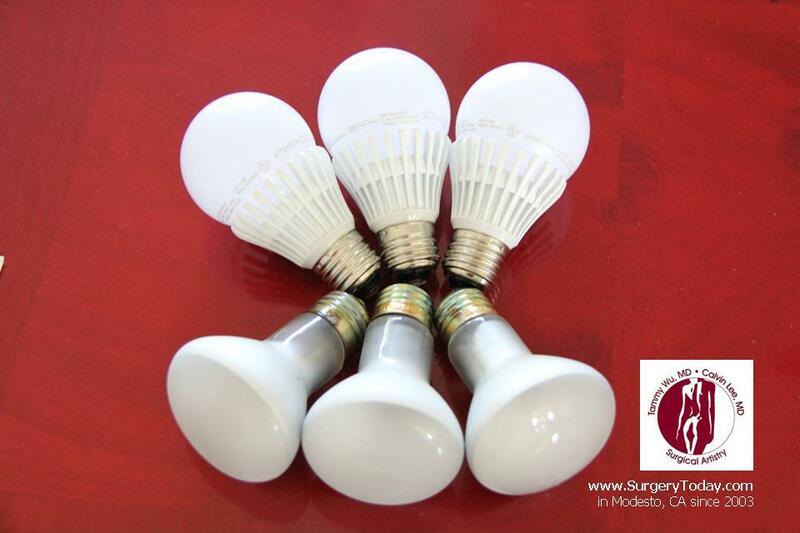 We use energy based devices such as lasers for aesthetic purposes. Understanding power, electricity, kWh, Joules, are all important aspects of understanding how to work with lasers. kWh = kilowatt hour = a unit of energy equal to 1000 watt hours or 3.6 megajoules. J = Joule is a unit of energy. It is equal to the energy expended in applying a force of one newton through a distance of 21 meter. At Surgical Artistry, we have the Dornier 940 diode laser from Germany for spider veins and for endoluminal ablation of refluxing veins, it does measurements in Joules/cm2. Meaning about of energy applied to a square cm2 area. I’m always looking at these settings carefully when performing vein procedures. I’ve always enjoyed physics, not just these formulas. Perhaps it runs in my family, as there are several physics professionals in my family. But there’s a whole field on the physics of electricity, energy, and lasers. And all this info is worth reviewing for physicians who work with lasers and other energy sources. Conclusion from the above experiment of cleaning the solar panels and measuring output before and afterwards? We have confounding issues of weather conditions ie. clouds. I think it is safe to say that there would be at least a 10% improvement. My measurements show 26% improvement by comparing 4 days before washing and 4 days after washing the solar panels. Then my comparison showed a 13% improvement taking the 2 best days of the 4 days before and comparing with the 2 best days 4 days after washing. And yes, doing experiments like this is useful for me in my continued medical education. This entry was posted in Modesto, Solar Energy and tagged solar on May 12, 2013 by Calvin Lee, MD.